Kwanzaa activities can be enjoyed at a Kwanzaa party or throughout the holiday week, December 26 through January 1. 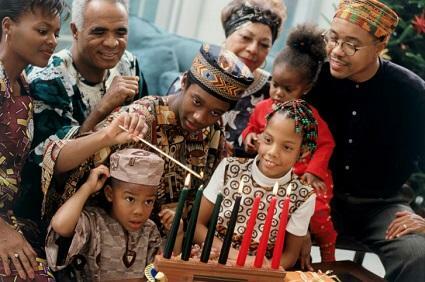 Unlike Christmas or Easter celebrations, Kwanzaa is not a typical religious holiday. Emphasis is placed upon teaching traditional African values and celebrating the heritage of Africans and African Americans during the weeklong celebration. Party games are not only the best ice breakers, but keep people mingling and busy while they await the Karamu. Split the children and adults into separate groups, team them up or just let everyone choose what piques their interest. Games like Myrshim and Mancala are great for getting things started. Because the holiday partially originated from traditional African harvest gatherings, food and cooking are often a big part of the celebration. Hosting a recipe exchange featuring traditional Kwanzaa recipes is a wonderful activity that both adults and children can participate in. During Kwanzaa, children and adults do exchange gifts, although it is very different from Christmas gift exchanges celebrated by both secular and religious Americans on December 24 or 25. Instead, the focus is on making homemade gifts, especially ones that will be appreciated by the particular recipient. Kids can also help cross something off the Kwanzaa party event planning checklist. Hand them some construction paper, glue, magazines, scissors and markers. Let them make party invitations to send to family and friends for the Kwanzaa feast, called Karamu. The main focus of a Kwanzaa party would be the Karamu, the Kwanzaa feast held on December 31. In addition to the big meal, people can share a bit of cultural history, through a story, fable, song or dance. However, families who are not familiar with the history of Kwanzaa may not feel comfortable following the structure set out by Karenga, especially if they are not of African descent. In these cases, usually when Kwanzaa is being celebrated to provide education in cultural diversity, the host may want to speak a few moments about the importance of African cultural heritage before the Karamu feast begins. Include information and facts about the traditional program, even if it is not being followed. Throughout dinner, play traditional African music in the background. After the dinner is over, a few words of thanks may be given, followed by more music or even dancing. The seven day celebration of African heritage offers plenty of opportunities to use Kwanzaa activities to reinforce the message of honoring African-American's cultural roots.